WASHINGTON, DC – The U.S. Commission on International Religious Freedom (USCIRF) has released a report that shows how blasphemy laws around the world fall short of international human rights benchmarks. “Respecting Rights? 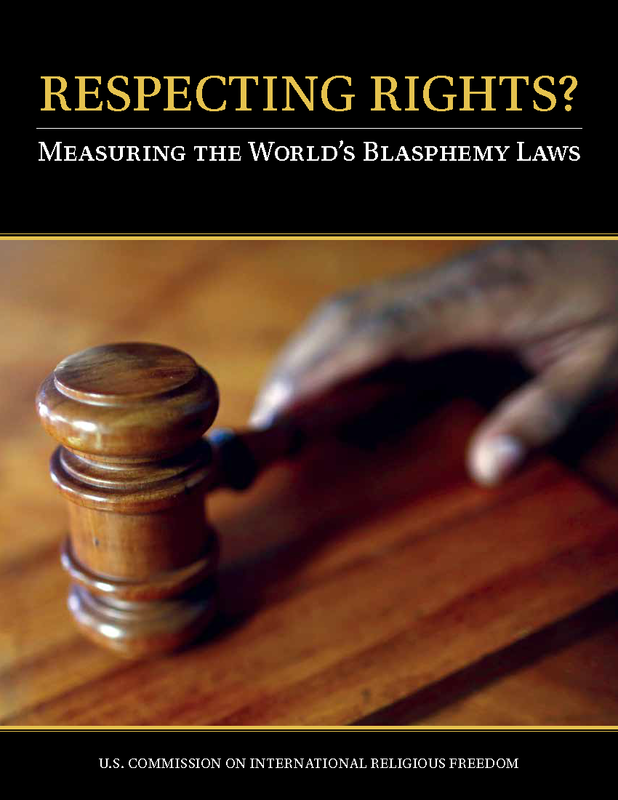 Measuring the World’s Blasphemy Laws” catalogs the offending laws found in a wide range of countries. In some countries, blasphemy laws are enforced weakly, if at all, yet such laws, “in both theory and practice, harm individuals and societies.” The report details laws spanning the globe from countries such as Canada and Switzerland to Iran and Indonesia with penalties ranging from fines to death. Surprisingly, more than one-third of the world’s nations have blasphemy laws today. The report compared the text of blasphemy laws against such indicators as freedom of expression, freedom of religion or belief, vagueness of the law, severity of penalty, discrimination against groups, and state religion protections. Most laws in the study failed to protect freedom of expression, were vaguely worded, and carried unduly harsh penalties for violators. In all five of the worst-scoring countries (Iran, Pakistan, Yemen, Somalia, and Qatar), the blasphemy laws aim to protect the state religion of Islam in a way that impermissibly discriminates among different groups. When societies wish to defend people of faith from speech that offends them, private citizens must act, not the government, and they must act peacefully, never with violence. In such cases, solidarity across faiths can be a powerful tool for promoting tolerance and mutual respect. The full report may be found at www.USCIRF.gov. Follow USCIRF’s posting about this report on Twitter (@USCIRF) and Facebook (www.facebook.com/USCIRF/).